By no means had I planned to invoke the divine words of wisdom found within certain religious texts, like the Holy Bible. Besides, I’m hardly qualified. 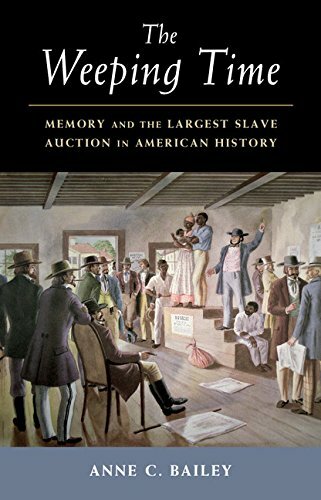 In fact, I was prepared to address the recent, praiseworthy release and excellent chronicalization of slave auction dynamics by Anne C. Bailey (“The Weeping Time: Memory and the Largest Slave Auction in American History,” Cambridge University Press, October 9, 2017). This professor of History and Africana Studies, at New York’s Binghamton University, provides a compelling review of the harsh realities of plantation slavery in the Georgia Sea Islands which ought to be mandatory reading in classroom history books across America. And, now is never too late. Perhaps, I can revisit the reasons why, later. But, for now, I should explain the detour from my initial plans to review more of Professor Bailey’s remarkable work within “Weeping Time.…” The nagging, recent events within our nation’s bizarre sociopolitical climate, including questionable behavior on the landscape of partisan political reasoning, has certainly given rise to at least pushing the pause button for where these once-United States of America now seems to be. The curious resurgence of die-hard racist, anti-Semitic, anti-American and other reactionary groups is astonishing, but somewhat predictable, based on the newfound wedges of deep division being driven between racial, ethnic and cultural groups in America. The recent resurrection of 2016 election-era conspiracies is concerning and baffling, namely the “Access Hollywood tape was fake news…” report (Washington Post, Nov. 27, 2017) and the claim that “President Trump reportedly revives birther claims against Obama” (Jessica Chia, New York Daily News, Nov. 29, 2017). Yet, it’s not at all too surprising, considering the sobering realties looming on the nation’s political landscape. And, the disrespect to the WWII, Marine Corp’s Navajo “Code Talkers,” at the White House ceremony on November 27, 2017, merely punctuates the wave of recent events. History itself has been hijacked. The Pre-Columbian history of the Native American in his own lands has been twisted and distorted the most, but in a vicious manner similar to that of African-, Asian- or Middle Eastern-Americans, as well as those of Hispanic or Latino ethnic origins. Is it because of the recent U.S. Census Bureau projection that whites will become a so-called “minority” in 2044, replaced by black and brown people? (See: https://www.commerce.gov/news/blog/2015/03/new-census-bureau-report-analyzes-us-population-projections-nation-expected-become) Is there a new season of reason that’s now upon us? What exactly is the message within the Nazi-chanting, white nationalist’s “tiki-torch march” on the University of Virginia campus, in Charlottesville, during August 2017? For me, growing up in the racially segregated, Jim Crow South, it was remindful of the pea-brained, Ku Klux Klan marches of the 1950’s and 60’s to denounce or intimidate immigrants, African-Americans, Catholics, Jews, and organized labor; they were often a prelude of things to come, like the cowardly bombing of black schools and churches and selected violence against American citizens, black and white. As a Viet Nam Era veteran of this nation’s proud and prized armed forces, there are many times I no longer recognize the social or political landscaping of the country I once proudly served. While the cultural and racial divide in America has sunk to new lows, the bumpy political landscape seems even worse! Incredulously, some will argue that it’s because of our former president, #44, Barack Obama. Others passionately claim that the root cause of our national dysfunctions stems directly from the profound lack of leadership of the current president, #45, Donald John Trump. But, there’s one thing I’m sure of: Simply talking tough and donning a brown military-bomber-jacket and cap trimmed with “scrambled eggs” does not automatically give one the kind of decision-making skills required to lead our diverse and exceptional military forces. Clearly, something is wrong in Washington. And, I am beginning to worry. Either, political polling seems to have become a lost art, or the populations being polled are simply lying through their teeth—not to mention the almost daily obfuscation, falsification and/or misrepresentation of material facts, seemingly put forth to consider or resolve within the political status quo. This is interesting, since many important issues now seem to be addressed from the presidential palace, based on public-opinion polls. Has statesmanship and leadership been replaced by daily, political party “talking-point” memorandums? Logical reasoning, once the hallmark of good government, or at least practical in the short-run, now seems elusive and slippery as the Mediterranean eel. And, the ongoing investigation into the suspicious influence of ‘Russian meddling’, before and after the recent presidential electioneering is worrisome. Political-related headlines loudly proclaim the assaulting waves of “sexual harassment allegations” now slamming Washington D.C.’s political playground. Yet, the widening scope of similar allegations is creeping across the nation and all sorts of heretofore taboo nooks-and-crannies. And, the ongoing exodus of officials, and decades of experience, at all levels of the U.S. State Department is hurtful in addressing newly surfacing crises in foreign or international relations. I recall these particular words from English Literature many years ago which suggested that we were all connected to each other, our flaws and failures, as well as our fruitions or fulfillments. “Perchance,” the reason for the state of flux we seem to have been in since before November 8, 2016 is unclear. However, as a child of the 50s and 60s, and U.S. Navy veteran- with haunting memories of the Cold War years and many weeks of up close up and personal involvement in the Cuban Blockade– I am very concerned for the current administration’s propensity for cozying up to Russia, at the embarrassing expense of proven allies around the world. And, the international tension we experienced during the run up to the 1962 Cuban Crisis now seems to have returned with the unfiltered development of a more nuclear North Korea. At least, it’s what I recall from how I was raised, in spite of the Jim Crow-based socioeconomic contradictions swirling around us. The profound care and guidance of strong black teachers and preachers gave my community hope that this nation would someday realize the value of our obvious interconnectivity. I was raised within the beliefs that we, as human beings, are all some part cousin and related along the way, whether we like it or not. And, honestly, yes, there were times when I didn’t like it at all! But, I’m now more than just concerned for how the 1st Amendment of the U.S. Constitution is being interpreted these days, especially as it concerns infringement on the “freedom of the press,” not to mention the 2nd Amendment and gun control rights. The Sandy Hook Elementary School shooting (in Newtown, Connecticut, December 14, 2012) should have shocked us all back to our senses… but, it did not! Ask yourself: Why? Where was logic and reason back then? Don’t get it twisted. It’s got nothing to do with race or the color of one’s skin. But, it certainly was a time to weep… and we dropped the ball on that! Where, oh where has reason gone? And, where oh where are we, today? Well, I guess that brings me back to about where I started– I mean, back to revisiting the reasons why the harsh realities of plantation slavery in the Georgia Sea Islands and Anne C. Bailey’s “The Weeping Time…” ought to be required reading for American history classrooms. Many of the reasons I had planned to mention stem from personal observations while visiting the Gullah/ Geechee culture in the Low-Country regions of Georgia and South Carolina. It’s a vibrant culture chock-full of the African influences which contribute heavily to the American way of life. Yet, while I chose to focus on what seems to be current social dysfunctions within our nation, in a very profound and very much American way, revisiting the harshness of history’s yesteryear can still tell you a lot about “…A time to weep, and a time to laugh; a time to mourn… a time to keep silence, and a time to speak…”– especially in times like these, just as Anne C. Bailey’s newly published book (“The Weeping Time: Memory and the Largest Slave Auction in American History”) reminds us all of our interconnectivity. At minimum, it reveals many things about where the character of our nation comes from and the uncomfortable past that ties us all together– but, now walking on eggshells, within the rather clumsy collective pursuits of happiness and freedom. The holiday season is approaching; but, perhaps, it’s also the season for our nation to push the pause button in partisan political reasoning, too. After all, “now” is never too late. The painful strands of our connective history shows us why. And, you are welcome… Please be on the lookout for my new novel, also along the lines of interconnectedness. It’s called “Backroads to ‘Bethlehem’….” It concerns so-called ‘runaway-slave’ communities in the Americas (release date pending, hopefully around springtime). Merry Christmas! Thank you William Smither for emphasizing the theme of interconnectedness in the book. THere is hope in that and hope in the resilience of the families of those sold on the auction block. Refugee Crisis' Religious Ban: Deplorable Diplomacy...?